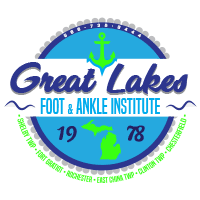 Sports injuries can happen in many ways, but one thing is always true: You need an experienced sports medicine specialist like the podiatric medicine doctors at Great Lakes Foot and Ankle Institute PC. Book an appointment online or by phone now at one of the six convenient locations in Chesterfield, Clinton Township, Fort Gratiot, East China Township, Shelby Township, and Rochester, Michigan. Ankle sprains can happen during sports and other activities. Ankle sprains can cause pain, swelling, and inflammation. In the most serious ankle sprains, you can stretch or tear your ankle ligaments and cause even worse pain. Fractures can happen in a few different ways. Sometimes, a fracture happens when you collide with someone else or when you fall the wrong way. In other cases, small cracks called stress fractures can happen after repeated strain. For example, a runner may develop a stress fracture in their ankle when training for a marathon. Depending on the type of fracture, the pain can be either immediate and severe or more subtle and gradual. Your Achilles tendon, which joins your calf muscle to your heel, is crucial for normal foot and leg motion. Achilles tendon injuries often occur in sports athletes who train hard on the weekends but not during the week. Extreme stress on your Achilles tendon, especially in a short period of time, can cause inflammation or even rupture. If you're dealing with any of these foot or ankle injuries, it's important that you don't continue physical activity until you get checked out by your Great Lakes Foot and Ankle Institute PC podiatrist. Sports injuries can turn chronic if you don't get help. Sports injury treatment depends on the nature of your injury, the type of symptoms you're having, and other factors specific to your situation. Treatments can include rest, ice packs, and elevation at home. You may also need custom orthotics, medication, and, in some cases, surgery. Platelet-rich plasma injections, either as injection therapy or as a surgery supplement, can speed healing when you have tendon or ligament injuries and may help with fracture repair, as well. How can I prevent sports injuries in the future? To reduce your risk of future sports injuries, try the following things. Your podiatrist may have some other customized suggestions, as well. Book your appointment at the Great Lakes Foot and Ankle Institute PC location nearest you online or by phone now.